Craft beer is built on community. It's the whole reason most of us got into this business in the first place. When we learned about our friends at Common Roots losing their brewery in a terrible fire, the community needed to help, do what we could to help in our neighbors in their time of need. In the spirit of that community, it's time for us to pitch by doing what we do best: sharing beers with our friends and neighbors and celebrating what makes craft beer so awesome. 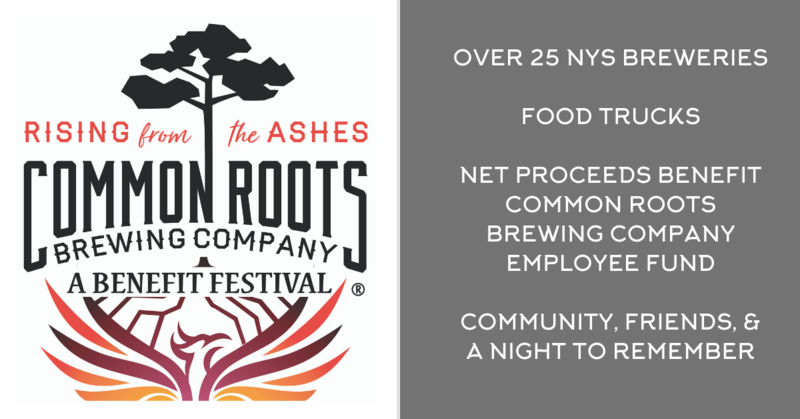 Please join us and an incredible line-up of brewers from across NYS for "Rising From The Ashes"- a benefit festival raising funds for the staff of Common Roots Brewing Company. All net proceeds will be donated to the Staff fund, accomplished through the incredible generosity of local businesses and breweries from across the state, who share our belief in community. Let's raise our glasses, share some laughs with our neighbors, and celebrate all the good things in the future for our friends at Common Roots! PLEASE NOTE: This event is for those 21 years of age or older. Proper ID is required for admission. No pets or kids are permitted.